Let perseverance be your engine and hope your fuel. ~H. 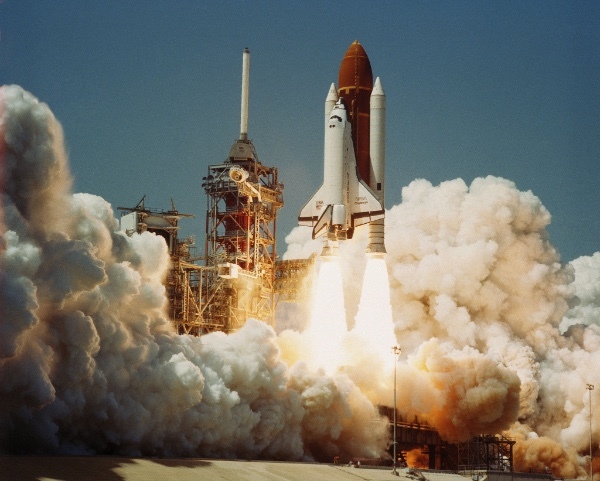 Jackson Brown, Jr.
Space shuttle launches sure are dramatic, aren’t they? Even the countdown amplifies everyone’s anticipation. And what a dramatic visual – water vapor, smoke and fire billowing around the shuttle and its companion rockets as they jettison up to the heavens. Amidst all of that drama, and compared to the huge orange rocket it piggybacks on (and the two long skinny rockets that flank it) the shuttle almost seems small, doesn’t it? There seems to be a whole lotta rocket for not much shuttle. It’s really hard to get off the ground. Inertia is such a powerful force that it takes extra energy just to get moving. That’s even more true when you’re talking about something as hulking as the space shuttle, which is about 20 times heavier than a commercial airliner. Enter those two long skinny rockets – also known as rocket boosters. Together they provide 80% of the thrust at liftoff and during the first stage of the ascent. 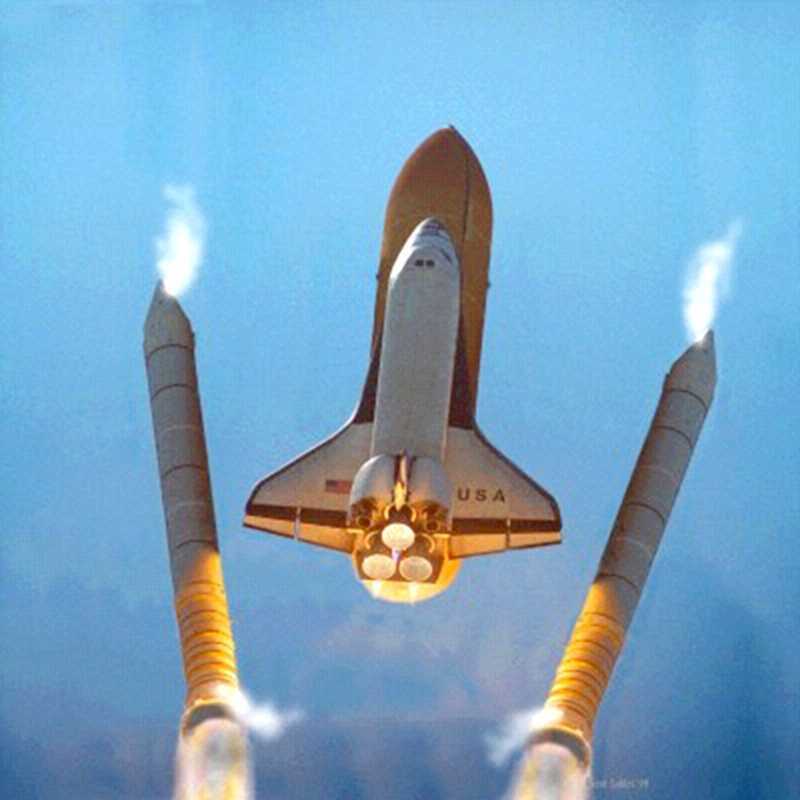 They give the shuttle the “boost,” the extra push, the sheer force to take off. But once they get things up and moving, they’ve done their work. They’ve used up their usefulness. The rocket boosters can only take things so far, and then they fall away to leave the rest of the ascent to the orange rocket, which supplies the alternate fuel. So the shuttle can’t rely *just* on the rocket boosters to get it into orbit. But it can’t launch without them, either. After the election, we took off like a rocket. Our anger and outrage propelled us like those rocket boosters – sending us headlong into a fight that we never thought we’d wage and a movement that is historic in its size and energy. We’ve been credited with literally changing our democracy. In the span of just a few months we have participated in record-breaking marches and inspiring protests; we have raised unprecedented amounts for important causes; and notwithstanding consolidated republican power, we’ve thwarted major legislative initiatives and changed the very conversation the public is having about government. We ascended higher and faster than anyone could have expected. After decades of inertia, we needed the propulsion that anger and fear gave us to get off the ground. But now those rocket boosters – that anger, and that outrage – are falling away, aren’t they? Being outraged is difficult when you’re no longer shocked. And we’re learning that while anger is a powerful motivator, it’s not a sustainable fuel source. And so, we need alternative fuel. We need the fuel that will sustain our movement, our cause, the Resistancefor the long haul. We need to not only engage in self-care, but in care for the movement itself. Let’s face it – we’re not a party that has ever been fully galvanized by fear tactics or red meat. So we have to find a way to do this our way. We can be the opposition party that derives its energy from a positive place – from our strong-hearted confidence that our world will be better when we lift everyone up and open all the doors. We can replace anger with hope. Fear with love. Indignation with kindness. Without that, we won’t reach our highest potential. Which, as you know, is out of this world. First, join Indivisible and MoveOn tonight at 9:00 p.m. (EST) for a Facebook Live event to discuss what we can do now to save the ACA. If you have questions you’d like the organizers to answer, you can post them here. Then tune in tonight and join the conversation. Second, call your Rep. and remind them that you care deeply about health care and that if they care about their job they’ll protect the ACA. Script: Hi, my name is ____ and I’m a constituent at ____. I’m calling in support of the ACA and to ask Rep _____ to vote no if any vote to repeal the ACA comes to the floor. Honestly, we’ve had enough already. This bill isn’t something the American people want, and it’s not anything that Rep ____’s constituents want. If Rep. ____ decides to vote to repeal the ACA, I will do everything in my power to find and support his/her opponent. WEDNESDAY: CALL YOUR SENATOR TO SUPPORT SB 987 AND CONTINUE THE CLIMATE MARCH MOMENTUM! First, the Sierra Club will be holding a climate resistance telebriefing on May 8th. Sign up here to attend, and get a group of friends and fellow resisters together to watch with you! Indeed! This bill also provides resources to help those Americans that work in the fossil-fuel industries “find good jobs in growth industries of the future, and get fair benefits between jobs or at retirement.” I know that we all have been empathetic to the needs of these workers, and I’m happy that this legislation doesn’t neglect them. So let’s let our Senators know that we support the transition to clean energy. Script: My name is ___ and I’m a constituent at ___. I’m calling to ask Senator ___ to support SB 987, the 100 in ’50 Bill. It’s high time that we created a plan to transition to 100% clean energy, and SB 987 does just that. (For Missouri activists: The flooding that we’ve had over the past few days is a good illustration of how our lives are going to be impacted by climate change.) What is Senator _____ doing to combat climate change, and his he/she in favor of this bill? If you’re like me, you cringe every time you hear about Trump’s tweets. It’s never good news. But thanks to three bad hombres, there’s now a brilliant way to make Trump’s tweets work for progressive causes. DonaldDonates.com is the first twitter-triggered donation platform. And, as the name implies, donations are triggered when DT tweets! Now, rather than wincing every time you hear that DT’s twitter fingers have shot off an insult to a foreign leader, you can smile – knowing that his tiny, tiny hands are funding his own demise. Maybe knowing that every time he tweets the Resistance gets more funding will make him think twice about taking to Twitter. Or maybe it will just give more progressive causes more cash to oppose him at every turn. So the biggest action this week – the most important, and perhaps the most difficult – is to really sit down and think hard about what you need to do to make your activism sustainable. And then, please, be intentional about incorporating the kind of activism that ignites your fuel. I wish I could tell you what your alternative fuel is, but it’s different for everyone, so I’ve provided a few questions that might help you nail down your mojo. When you find out what your mojo is, understand that activities that ignite that fuel are no longer optional maybe-if-I-have-the-time activities. They really should be priorities. Do I get energy from being around people OR from introspection? Being around people? Make weekly or bi-weekly coffee meetings with activist groups a priority. You know where to find these groups in your area – now you just need to find meetings of those groups that happen at a convenient time and place. And then go. Introspection? Meditation, yoga, and gardening are some of my favorites for clearing my heart and mind. Inspirational books like The Crossroads Between Should and Must are also high on my list. Do I get energy from seeing progress/tangible results? Engage in activities where you see your impact more immediately – like voter registration, gathering signatures for petitions, and door knocking. Help set up larger meetings or trainings where you’ll see the turnout that you achieve. Track your own progress. Log the number of calls that you make each day. If you make five calls a week at five minutes each, that’s 25 minutes of staffer time that you’ve taken up. Get chatty and keep track! Do I get energy from seeing what is left to do [OR] seeing what we’ve accomplished already? Keep a running tally of accomplishments, a la Indivisible San Francisco’s 100 days of resistance (hat tip to Jen Hoffman for pointing this out!). Keep a list of things to do or things to protect and tack it on the back of a door. Cross accomplishments off or give yourself a star to celebrate when we’ve met a goal. Do I just find energy in helping people do good things? Then just put yourself out there. Be creative. There are nearly 6,000 constituent groups that are registered with Indivisible. What skills do you have that you could lend to one of those groups? Everyone has a skill that can and should be used in the Resistance. Yes. I’m looking at you. Do you make wickedly awesome cookies? Offer to bring some to their next meeting. Are you a musician? Write a song about the resistance and sing it at the next protest. Make it a roast about DT. Folks will love it! Do you sew? Offer to help make a nifty banner to use at marches. Do you like scrapbooking? Offer to create a card for your MOCs for the next issue. Are you good with kids? Offer to provide free childcare in an adjacent room for the next meeting. Do you have a car? Offer to drive people to meetings. Do I allow myself to fully appreciate what I’m doing, have done, and will do? Think for five minutes about what you’ve done since November 9. You’re a different person, aren’t you? You’ve got new skills, new friends, and maybe a new job. Reminder: It’s only been six months. Be proud of yourself. You’ve earned it. If someone sent you this pep talk – Welcome! If you’d like to sign up to get this pep talk and action list in your in-box each week, you can do that here.